Another economic commentator makes it into our categories with a corker of a piece, featured article of the week comes from Steve Betts at www.stockmarketbarometer.net – make sure you read this and act on it, your time is running out fast now. “When power leads man toward arrogance, poetry reminds him of his limitations. When power narrows the areas of man’s concern, poetry reminds him of the richness and diversity of his experience. When power corrupts, poetry cleanses. For art establishes the basic human truths which must serve as the touchstones of our judgment. It’s human nature to want to avoid the bad and embellish the good, but it seems to me that America has brought up two whole generations based on these characteristics. It seems America’s financial structure is based on the idea of something for nothing along with payments deferred into infinity. The fact that a supposedly responsible government refuses to acknowledge a debt problem, much less discuss it, guarantees that the aforementioned society will collapse. The longer Americans choose to live with the deception, the more violent the disintegration will be. There are all sorts of rumors floating around on the web about the administration building massive detention centers in the western part of the United States in preparation for civil unrest. I have no proof that such claims are factual but it would be a logical extension of present behavior. If they want to hang onto to their power, they’ll have to control the masses. Lying to the masses is a process and you end up with bigger lies are better than smaller lies, and simple is better than complicated. At the beginning of the lying process you often start out small and mold the situation to fit the lie and that’s what happened in the United States in the late 60’s. Then you add more lies, like bricks in a wall, but the lies grow bigger with the passage of time. Education is an important part of this process and helps hypnotize the masses. I remember when I was a freshman at the university and I took a beginning economics class. The first day we saw a movie and it opened with some professor at some Ivy League school coming down the stairs, like Moses descending from the mountain, and pausing to make a statement. He said the United States could never go broke and could create as much debt as it wanted without any real negative repercussions. In my ignorance I spoke up after the movie ended and opined that the message seemed somewhat lacking in fundamentals. I was immediately reminded that the class had no desire to know what I thought; we were there to absorb what the professor thought and that was that. The movie was not an anomaly, rather a reflection of the true mentality that existed in the United States, and still exists in certain quarters. The mighty can do no wrong! This attitude was created and fostered by the US Federal Reserve, current and past administrations, and in conjunction with a very small group of elite, some foreign and some domestic, that are the true wizards behind the curtain. Americans are also responsible as they voted for whoever made the best offer, regardless of whether it was based on sound fundamentals, although it usually wasn’t, and it allowed for instant gratification. The price of the gratification was always “cheap” and could be deferred well into some future generation. What’s more in the event of a problem the Federal Reserve could always be counted on to pump out liquidity and, Keynesian economics be damned, they would not withdraw it during the good times. The end result was a series of bubbles and the belief that asset values could only move one way, higher! Therefore an individual could take on as much debt as his little heart desired and rising asset prices would always bail him out. A family with a US $125,000 income could buy that third house, and a gas guzzling SUV to boot, and it would all work out just fine. There were glitches along the way in the form of external shocks like the Russian, Asian, and Mexican crisis’, and even a few internal shocks like the Tech Wreck and 9/11, but they were all good excuses to prime the pump. As luck would have it the Tech Wreck fell one year before 9/11 and the latter served as justification for a stimulus package that cut short what would have been a strong correction in asset values. That’s the rub; there was always an excuse. Democratic and Republican candidates maintained their stranglehold on politics because of the implied promise that there would always be an excuse. The seed crystal for this whole process came out of the 1907 stock market crash that devastated Wall Street but left Main Street mostly intact. The goal was to ensure that wealth would only flow in one direction, from the many to the few. The tools of choice were the IRS and the Federal Reserve, and the latter put into practice the famous quote from Baron Rothschild, “Give me control over a nation’s money, and I care not who writes the laws.” If the truth be known they didn’t care, and they still don’t. The shift in wealth was so slow, with every baby step approved by the peoples elected officials, and every violation of the US Constitution done in such a way that the populace accepted that the sacrifice was for a more secure nation. You’re gold and silver were replaced by fiat currency backed by the full faith and credit of the good old US of A. What more could you want? No one ever bothered to tell you that a 1913 US dollar bough the same thing, in both real and nominal terms, that an 1848 US dollar bought. On the other hand a 2010 Federal Reserve Note buys less than 2%, in real terms, of what a 1913 US dollar bought. That’s okay! Your elected officials decided that you didn’t need to know that. They also decided that you didn’t need to know how much if any gold was left in Ft. Knox, or what a true and honest balance sheet for the Federal Reserve looks like. Neither one of them has been audited in more than a half a century and the idea is that you’ll never know. So here you sit in 2010 as a citizen of the world’s largest debtor nation, forty years removed from being a creditor nation, and piling up US $2.6 trillion in deficits for 2010-2011. That by the way doesn’t include the war effort which is an off-balance sheet affair. You have to love our government: if it’s an unpleasant number, you simply don’t count it! Income and the economy are shrinking, unemployment is on the rise, debt is skyrocketing in the midst of a debt crisis, and the large majority of Americans have a little less with each passing month. It’s stealth poverty!! Obama gets in front of the cameras and tells us that jobs are his number one concern, and he looks very presidential when he says it, but his words no longer ring true. Americans are beginning to figure out that they were duped by this well left of center socialist who loves big government more than life itself. Mr. Obama is enamored with his own intelligence, but unfortunately you stop learning when that happens. To make matters worse the American people are beginning to catch on to the fact that he is the wrong man for the job; better yet he is not the man he pretended to be. The angel of change is turning out to be the devil of economic death. I can’t believe that he didn’t know what he was getting himself into. You don’t make your way through Chicago politics, and past Richard J Daley’s ghost, without knowing just how the game is played. As an aside, if you think the ex-governor of Illinois decided to broker Obama’s Senate seat without the President’s knowledge and participation in the proceeds, you had better think again. Favors are paid in full in Chicago politics. If the American people had simply read up on Chicago politics, they would have known what they were getting themselves into. After all it was the late Chicago Mayor Richard Daley who raised the dead from the graveyards and made John Kennedy president in 1960. So we have an untenable situation with an inappropriate leader. What’s more there is no plan to resolve the problem and even less political will to look for a solution. The current Federal Reserve Chairman Ben Bernanke boasted way back at the beginning of the last decade that deflation would not be a problem because the Fed had a printing press and helicopters, and knew how to use them. Unfortunately the poor fool fell asleep at the switch and failed to act in October 2007, denying that a problem existed when anybody with half a brain knew the jig was up. The Fed waited until March 2009 before implementing a “stimulus package” that created more debt in order to resolve a debt crisis. The twin errors of waiting too long to implement the wrong policy allowed deflation to get a headlock on the US economy, and deflation is the one mistake no could afford to make. The Fed is denying that deflation exists, refuses to even mention the word, calling this a period of “disinflation”. The problem is that Helicopter Ben and Timmy “The Tooth” Geithner already declared victory and held a celebration to honor the event. Hell, they did in the halls of Congress! Now it is painfully obvious to the whole world that their stimulus came up short, we are deflating at an accelerating pace, and no one has/wants a solution. They recently passed a US $26 billion bailout for the states but the state of Illinois announced today that they need US $120 billion to meet their unfunded obligations, and that estimate is considered painfully low by many people in a position to know. The United States has US $61 trillion in unfunded obligations, a projected budget deficit of US $1.1 trillion for 2011, a trade deficit that averages US $45 billion a month, and the beat goes on. The Fed came up with US $2 trillion out of thin air the last time around and has nothing to show for it. They bought lots of worthless assets at face value, but it was just so much paper down a deep, deep black financial hole. The Fed’s idea has always been to inflate the debt away by printing fiat currency, but the debt is now increasing faster than they can run to Congress and say “let me print more”! The markets know this as well and that’s why we are seeing cracks appear all over the dam. Rather than start with what is failing, it might be smarter to look at what is working and ask why. Alan Greenspan called gold a barbarous relic, the Fed has been trying to relegate gold to the financial trash bin for almost one hundred years, and yet gold grinds higher. The press almost never mentions gold unless it’s to say that Robert Prector, of Elliott Wave fame, has called a top to the bull market. He’s called four that I can recall and he’s yet to get it right, but if he keeps on doing it long enough the odds will eventually favor him. The last significant bottom came way back in October 2008 at 681.00 and it has been grinding higher ever since. Every reaction has brought out a chorus of top callers and yet they just never seem to catch on. Gold is doing what its doing because this is more than a bull market, it’s a warning that the wheels are coming off and the smart money is taking shelter from the storm in the form of yellow metal. Manipulation is running rampant as the Fed pulls out all the stops in an effort to hide the truth from the public, but to no avail. As you can see in the preceding chart the trend is clearly up and the corrections have been nothing compared to what happened to stocks, bonds, or commodities over the last three years. Why? Smart money does not bail from a true store of value! The smart money knows that all bull markets run in three phases. The gold bull market is still somewhere in the second phase so they will continue to accumulate during reasonable pullbacks and wait for the big moves higher that always accompany the third and most explosive phase. Most people fail to grasp the manipulation, believing the illusion that markets are free, and bail when they should be buying. Fortunately there are new players in town in the form of India, Russia, and China, and they’re taking on the Fed. I’m betting that they’ll win. These new players recognize gold for what it is, i.e. the one true money, and every time someone maneuvers the price lower they’ll be there to clean up. What’s even more important is that they are buying physical while the Fed is suppressing the price with paper. Virtual gold will never suppress the real thing! That’s what’s going on now and it will end badly for the Fed. The spot price of gold closed out the week with a 12.60 gain, going out at 1,227.70, and with blatant manipulation at 8:45 am EST each and every session. In spite of that gold is making a nice move as you can see in the previous chart and some say that it has formed an upside down head-and-shoulders formation. I think that’s a bit of a stretch but I’ve highlighted it anyway, and you can see that the price is well above the neckline. I maintain that if you go all the way back to May, gold has been trading in a range that stretches from 1,158.20 to 1,245.00, and it is still in a range. The longer gold stays in that range, the stronger the subsequent move higher will be. I continue to look for a test of strong resistance at 1,298.10 and then a move up to my target of 1,372.80. Of course if the Fed goes on another printing spree, and I think they will, all bets are off and gold could easily run as high as 1,500.00. As I mentioned earlier gold is still in the second phase of its bull market run, a stage highlighted by institutional buying. The second phase began with the price breaking out above 475.00 and has lasted longer than I anticipated. I would have thought gold breaking out decisively above 1,000.00 would have stimulated the interest of the general public, but I was wrong. That’s all right though because I view this process as a pressure cooker and the smart money keeps on throwing more wood into the stove. The tighter you close the relief valve, the larger the explosion! The more the Fed prints the higher the price goes until the dollar finally collapses and gold is recognized for what it is, i.e., the only real money. Does anything catch your attention? 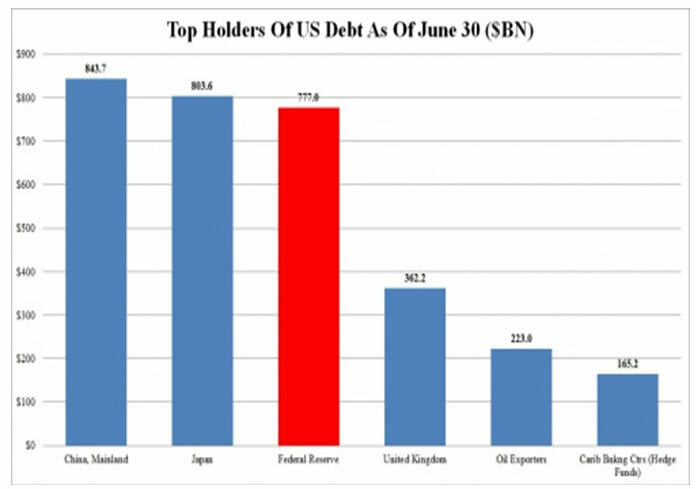 The US Federal Reserve is now the third largest holder of US debt in the world. In other words they are supporting the market and slowly transforming themselves into a buyer of last resort. There is only one step beyond that, and that’s becoming the only buyer. Bonds are to be avoided from here on out. and you can see that they’ve all topped and broken down from the rising trend, they’ve all formed significant head-and-shoulders formations (arrows), and they are all making lower highs. What’s more the Russell, the broadest index of all, appears to be breaking down more than the others and did not close above its June high like the Dow did (and neither did the S & P for that matter). With respect to the Dow I cannot emphasize enough what has happened since the April 26th top. There have been a grand total of twenty-four 90% days since the top, thirteen 90% down days and eleven 90% up days, an event without precedent in market history. Over the last two weeks we’ve seen two 90% down day, one on Wednesday August 11th that was followed three more down days, and one on Thursday August 19th that was followed by a losing session on Friday. This is extremely unusual activity because the very nature of a 90% down day implies an exhaustion of the urge to sell and yet each time the selling continued. The cash Dow closed on Friday at 10,213.62 and below both the 200-dma and the 50-dma, the same condition exists with the S & P and Russell, and the 50-dma has crossed below the 200-dma in a sign of weakness. No matter how you slice it these markets look like they are going a lot lower. This index has moved sideways out of its rising trend and is declining but with one notable difference, the absence of a head-and-shoulders formation. What’s more price is being compressed and, if we are in a bear market, the odds favor a breakout to the down side. In both the US and overseas we see declining volume and a significant number of stocks (more than 50%) trading below their respective 200-dma’s and that is quite bearish. I believe the US is setting up for a significant crash and you will see it this fall. You will see a move down similar to the so called “flash crash” but without the rebound later in the day. I believe you’ll test good support at 7,470 before the end of the year, and more than likely you’ll test the March 2009 low of 6,469. Although you may see a decent bounce, maybe as much as 2,000 points, and bringing out all the clowns who love to call bottoms, but that will not be the bottom. The market will turn down yet again and that’s when real fear will set in; the kind of fear that stays with you for decades and causes you to say those famous words “never gain”. The average investor is loaded with debt and he will not survive the onslaught that I see coming. The high standard of living that Americans have enjoyed for decades is about to take a serious haircut. People are going to become visibly upset and it will not be a good time to be a politician, and an even worse time to be a Fed official. The propaganda machine will hit high gear and the administration will be desperate for someone to blame. If the people don’t speak up and stop the administration, they’ll find themselves in another much bigger war that will affect every American in a bad way. American policy going back to the 1960’s has not made many friends, but we had money in those days so we were tolerated. Now we have a dangerous man in the White House and a bankrupt economy. The people who hold power will stop at nothing to keep it and those who speak up might end up in a concentration camp out in the Arizona desert if they aren’t careful. As I see it you have two avenues of protection open to you: buy gold and sell short the Dow. Even then it will not be easy. I see where the IRS declared gold a collectable so they can tax it at the highest level. A lot of people, including Richard Russell, don’t think the government will confiscate gold, but they will along everything else they can get their hands on. My hope is that we’ll see a President one day who will abolish the IRS and the Fed, put in a consumption tax, cut the government bureaucracy by around 70%, and able to live within the collective means of the nation. Eliminate pork and campaign contributions and return the power back to the American people as our Founding Fathers intended. These will of course be sweeping changes, and they will not come cheap, but it is the only solution. I would love nothing better than to see Benjamin Franklin’s republic take root on American soil. Gold would become money and the middle class would start to flourish again. It almost sounds too good to be true. The Manipulation is now out in the open with the 8:45 am setbacks, but they have less and less affect. That has to have the Fed unnerved to say the least. ..Start buying gold now – IT IS NOT YET TOO LATE! - Start protecting yourself with Gold now and receive a free Gram! Economics – Its All Lies! Previous post: Will Gold Hit $30,000 When Manipulation Finally Fails? – History Says Maybe..